Although my long blond hair clearly indicates that I’m a foreigner, over the years Mongolia has begun to feel like a bit of a second home. I’ll never be Mongolian enough to relish eating goat intestine as if it is some rare treat enjoyed on only the specialist of occasions, but the Mongolian lifestyle has become comfortably familiar. 2014 CCC Project: Collecting vials of cow milk from herders and running a fluorescence polarization assay to test for anti-Brucella antibodies. Orkhon Soum, Mongolia. 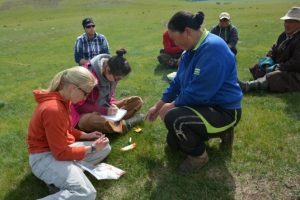 Returning to Mongolia on a CCC grant this past summer to study the zoonotic disease brucellosis was a special experience. I had lived in the country for 6 months in 2007, and I had been back once since but that was many years ago. And when I say that I “lived” in Mongolia, I really lived there in all senses of that word. 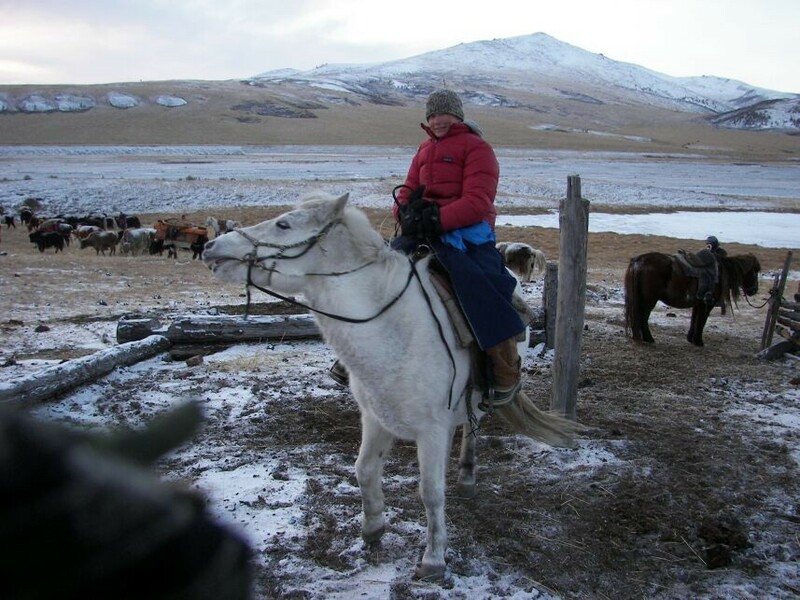 In 2007, I had just finished my undergraduate degree at Middlebury College, and I traveled to Mongolia on a Fulbright Scholarship to study veterinary and animal husbandry practices. My methodology was to learn by doing. 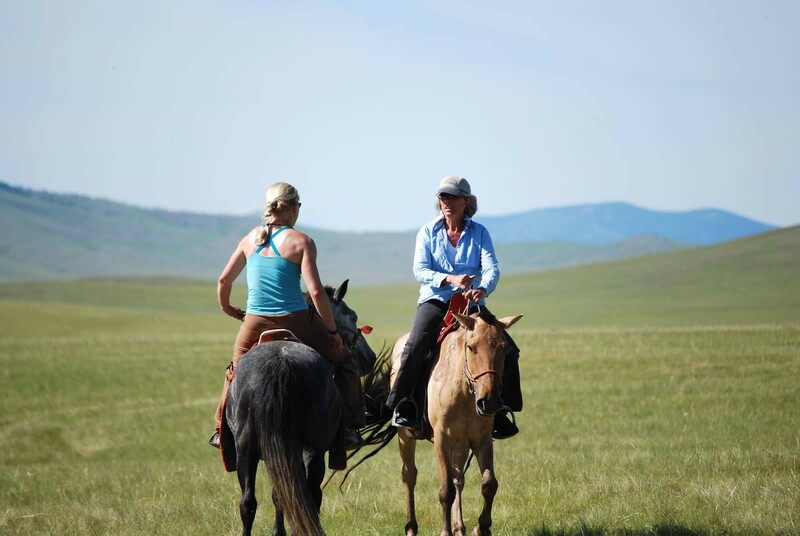 For most of those 6 months, I lived in far northern Mongolia with a nomadic herding family. Their children were too young to tend the herds, so I became the family’s adopted Mongolian child. I herded their yak to the watering hole on horseback, sat with their sheep and goat flock all day to protect them from wolves, and threw dung at their stubborn oxen that repeatedly refused to come down the mountainside to the corral at night. It wasn’t a romantic life. I got yelled at by my Mongolian “mom” to collect dung for the fire in the morning. I was always hungry and sick of eating bread and tea for ¾ of my subsistence. It was simply my life at the time. A life consisting of simple things like worrying whether you were returning home with all of the correct black yaks after the commotion at the communal watering hole. It was a life that allowed you time to reflect and to just think as you wandered back and forth over the hillside behind a sheep flock all day. The lifestyle lacked the rush of activity of errands, to do lists, and deadlines. It is difficult for me even to relate to what I did. That was then and this is my life now. Sampling during a 2009 brucellosis pilot study. Renchinlhumbe Soum, Mongolia. I have learned to wear many different “hats” in Mongolia. This summer there was no watching of the sheep flock or throwing of dung at oxen. 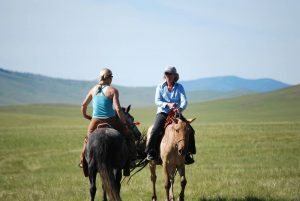 Instead I had my research “hat” on during most of my two months spent in Mongolia. Much of the time, I traveled with a group from BioRegions International, an American NGO based in Bozeman, Montana. I have worked with this group sporadically since 2007, and it was great to collaborate again. Unfortunately, much of my work seemed distant this year. 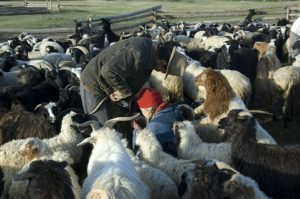 Previously, during a trip in 2009 I had traveled with BioRegions, yet I was still able to work alongside local Mongolian vets and herders corralling animals, drawing blood, and conversing in broken Mongolian. This year was different. I barely touched an animal. Vials for milk samples were distributed, and herders returned the next day with the samples. 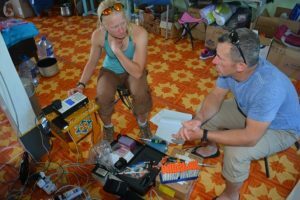 Although I visited some families to ask survey questions and provide brucellosis education workshops, much of my time was spent in the corner of a cabin or holed up in my tent with vials and vials of milk, various brucellosis testing reagents, and an old finicky testing machine. Veterinary work in Renchinlhumbe, Mongolia, 2007. After a month and a half of field work, I returned to Ulaanbaatar to work with scientists at the Mongolian State University of Agriculture. This was a bit of a surreal experience. While my first go at Mongolian life in 2007 was that of cold nights sleeping on the floor of a ger (Mongolian yurt), herding animals, and eating goat in all forms imaginable, here I was in the capital city with a daily agenda much like that at school in Colorado. A morning run was followed by a day working in the lab. The day ended with a swim in the public pool and a call to my boyfriend. The lab environment was not too different from that at CSU, besides the fact that nobody spoke English and that the city would randomly choose to shut off the power, forcing science to abruptly end for the day (very frustrating). I think some of the equipment at the University of Agriculture was actually less outdated than that in my lab back home. The public pool too, while having strange rules about showering and mandatory sandals, still had the same kick boards and pull buoys stacked along the walls as you would see back stateside. And talking with my boyfriend – there was no cell phone reception and only one phone that only sometimes worked in the entire Mongolian town near which I lived in 2007. Here in Ulaanbaatar (and in much of Mongolia these days), I could call home whenever I wanted, and I had a clearer phone connection than I often get in Fort Collins. 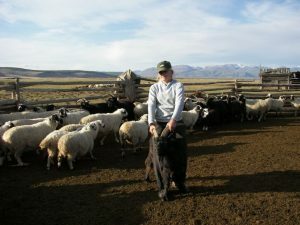 The approach I took to my work this summer in Mongolia was probably necessary if I was going to be “scientifically productive.” Sampling for disease prevalence requires large sample sizes, which with my limited time in country required me to be somewhat distant from family interactions and animal wrangling. I would call my trip a success, however. Through collaborators, I have already been able to return translated reports of testing results and disease prevention and treatment recommendations to the governors, veterinarians, and medical doctors I worked with this past summer. 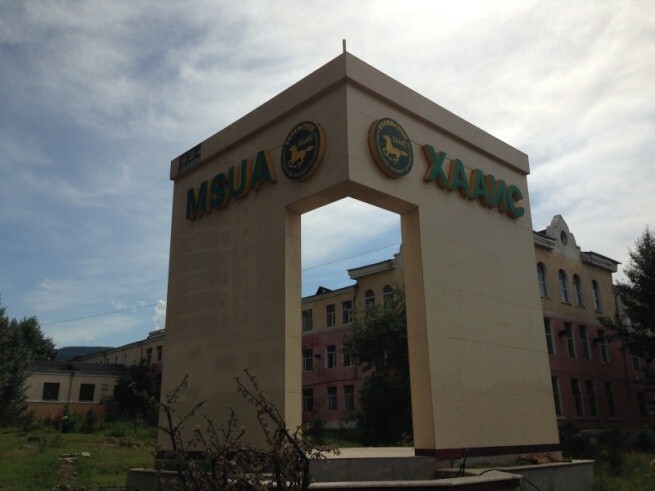 The door is wide open for more brucellosis work in Mongolia, and I’m sure I will find myself wrangling animals or running across the Mongolian steppe again, but first I have a doctoral and veterinary degree to finish. Full immersion: herding my family’s animals during their annual winter migration. Darhad Valley, Mongolia 2007. 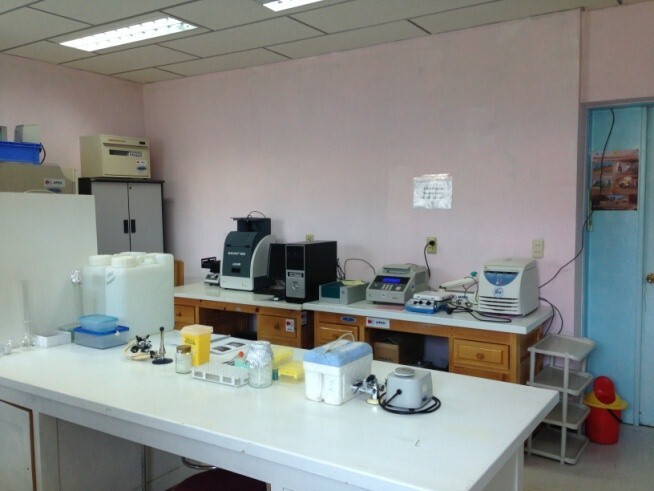 The research lab I worked in at the Mongolian State University of Agriculture. Ulaanbaatar, Mongolia.